With the 2013 con season over it is time to post some tutorials/builds of my 2013 work. 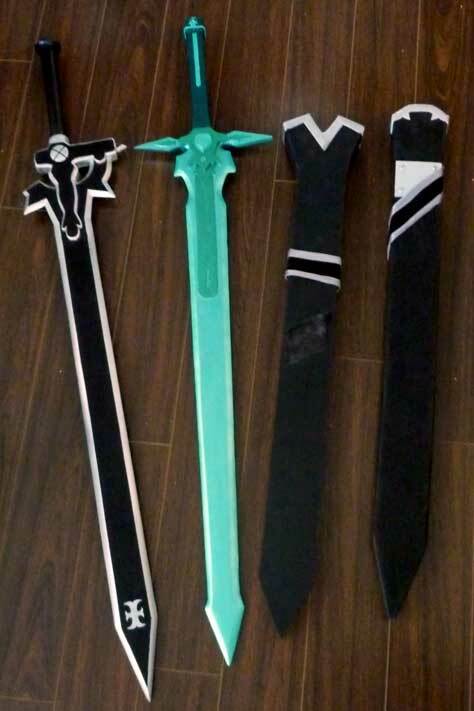 This will work through both of Kirito’s swords and sword cases; each was built in a different manner with different materials because I wanted to play around with materials this year. 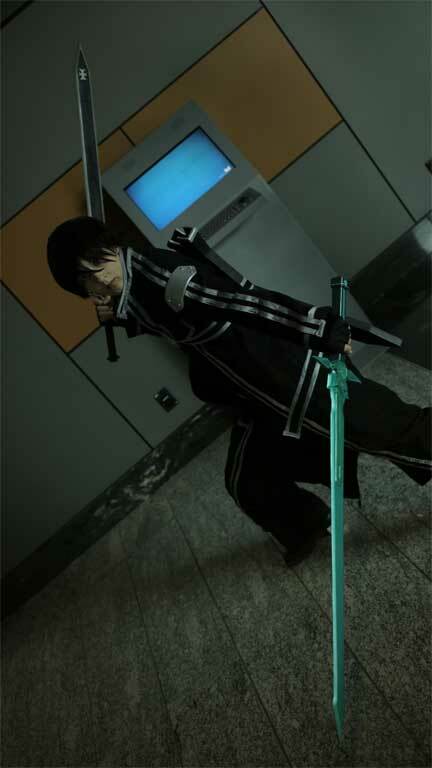 It’ll also discuss how the swords were mounted and a bit to do with the few pieces of armour Kirito has. 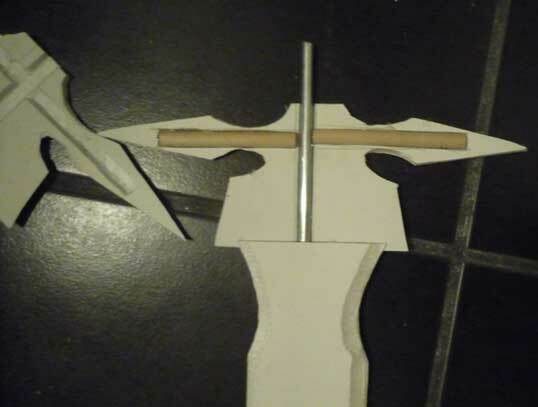 This is foam board and a square 1” wooden dowel for a handle, the same dowel I used for Homura’s bow. Cut the basic shape from foam board, you’ll want two of each piece, I use a straight edge and foam board cutter from Logan (foamwerks). These simply made the cuts easier and faster, this process is perfectly possible with a ruler and an exacto knife. Once the base is cut the edges need to be cut to a 45 degree angle. I suggest doing this afterwards so that you can watch the angle closely and make any needed adjustments as you create it. With the foam board cutter this can be simply done by setting the cutter to 45 degrees and running it along the sides. Take time on this, you want as clean of a cut as possible so you have less retouching and clean up to do later. In my case my foam board was smaller than my sword, so the top bit is a different piece. Please excuse the cat, he seems to believe that he can help with cosplay props. At this point you are going to cut channels for doweling. You’ll want ¼” doweling. Place it upon the foam board piece on the backside and trace it, then check that you have right around a ¼” apart set of lines. You are going to very carefully cut into the foam board, but not far enough to pierce the entire piece. Peel out the foam and you’ll be left with the above featured picture. I used a screw driver with a flat head to dig out the foam surface, be careful not to damage the front covering or it will show on your final sword. Do this to both pieces such that the channel lines up exactly on the two sword pieces. For the top a ¼” aluminum rod was used in place of doweling, as this will connect into the handle. The detail pieces also contain small bits of doweling. Glue the doweling into the first piece, and then glue the second on so that it perfectly lines up with the first. You may have some small touch ups to do with cutting at this point, any errors you made in cutting the angles will be fixed shortly. Once everything is placed correctly you can either do angle fixing or detailing. I did my detailing first, then my patching/fixing. My detailing was done out of craft foam, worbla and extra craft foam. There is foam with an adhesive backing on it that is perfect for work like this. The handle was connected by drilling a hole into the square doweling, after sanding it to soften the edges, then attached to the sword with glue in both the hole and on the base of the sword. The edges now all need to be seal and fixed. I used paper clay to do this however it would also be possible to do this with bondo (I believe) or spackling. Use whichever material you would like to use for patching, the application is all very much the same. Smooth the patching material over the edges and fill in any spots that were cut funny and any places on the face of the sword that require touch up. Sand the patching to create a smooth edge; I suggest getting to the range of at least 220 on sanding if not 400. Once you are satisfied with your patching apply gesso to the entire sword, including the foam board face. 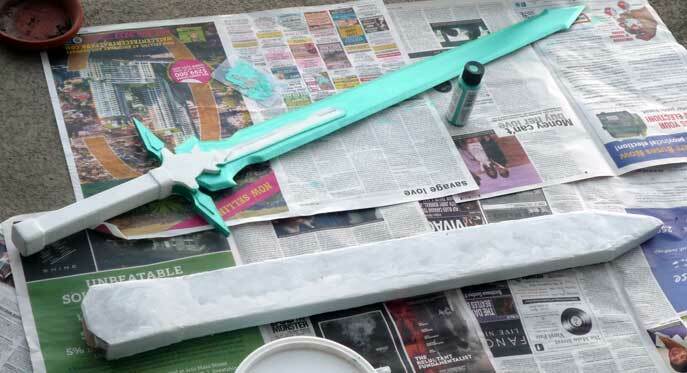 Apply 3-6 layers then sand the entire sword to 400. I’m a fan of wet sanding, but it isn’t mandatory. The paints I used were Folkart Plaid metallic aquamarine for the main part of the sword, emerald green for the details and a custom mixed teal for the handle. Just the aquamarine paint & the Elucidator’s case in paint prep stage. The gems are resin cast out of a custom made mold. To do this a base gem was first created with fimo, baked, used to create a mold out of Easy Mold (handy silicone mold maker) then cast out of polyester resin. The backing of the gems is painted with the aquamarine colour. The final detailing on the handle is some strips of styrene and a very thin strip of the adhesive foam, coloured in aquamarine paint. The entire sword is seal and finished with Future by Pledge, a great high gloss hard coat for cosplay props (and floors, apparently). I was happy with this sword, it was light, it looked good and was fast and easy to make. If you don’t want to put the love and attention into a wooden sword and I would absolutely recommend this technique. My other 2013 con photos are posted on my facebook. Some nice photos of my Haseo cosplay with a new prop, his scythe Shadowy Death. Thank you, really helpful information. This is actually my first cosplay project and I’m happy to see that I’m on the right track. I’m actually working on the elucidator right now, but I’m trying to veer away from the wood working. If you don’t mind me asking do you believe the 45 degree angle will give a solid definition for the edges? Did you cut the front and back of the board to make the edge for both sides on this project? I’m using 5mm craft foam, not nearly as sturdy. Any advice is appreciated. Loving it so far and thank you for making these help guides. Question, why craft foam for a sword? I would very strongly advise against that. Foamboard is not craft foam and craft foam won’t really do the job. You aren’t going to achieve the appearance you could from craft foam and the blade won’t last nearly as long. If you look at the images in the tutorial I cut two copies of the blade, cut 45 degree angles on each side and glued it together, which it needed so that you can insert the doweling into the centre of the blade. My elucidator edges were more than 45 degrees as they were the entire silver edge, so I would suggest to make those edges bigger. And sorry, I gave insufficient information earlier; I was posting via mobile. What my original plan was to craft the shape from the foam and then add a layer of worbla or wonderflex, gesso a few times, sand down , and eventually paint. The first test I did with Worbla was actually with a foam board core, but when I tested the durability I heard the pop of the board breaking underneath. But my question was answered; with it being more than a 45 I am going to have to tinker and see what will work out. As for the edges, I don’t know why I asked you both sides when I knew you did both pieces and put them together. 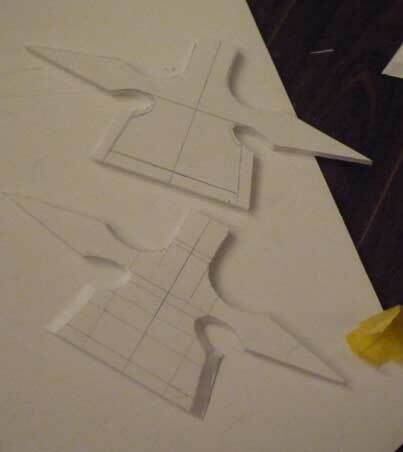 At this point though I will be using foam board mainly because of the size you can get it in and being able to make the whole blade from one sheet. We don’t have it that big locally, but I can order it online. Hopefully it doesn’t turn into a giant mess and I’ll try to link a picture when finished. Thanks again for all your help. How did you make the perfect 45 degree angle? And what foam board did you use exactly? I’m stuck before I barely got started. I have a Foamwerks cutter. It allows me to cut either straight or at a 45 degree angle, in addition to this I use trigonometry to figure out my cuts for things like this. Thankfully because it is a 45 degree angle it is simply equal to the thickness of the foamboard, about 5mm or .1875 (3/16) of an inch. Then carefully run your blade along the line drawn on the foamboard and the very edge of it, being as careful as you can to cut smoothly. If you do mess up the edge a bit something like paper clay or spackling can be used to fix the edge (aka, if you are like me). I used Elmer’s foamboard, you can get it at staples or any art store. Same stuff used in kid’s art fairs as display boards. Do you have the template for Dark Repulser because I would like to make this out of wood. I don’t share my templates as I like to encourage people to learn to build their own templates. This sword is a great beginner’s templating job – it has identical measurements to the blade on the elucidator, only the top/very bottom are different. Otherwise I believe soynut props has a google sketchup version posted. I wouldn’t suggest it, you’d likely damage it. I like how it looks. I’m actually planning on trying to build this sword for ACen in Chicago this year. I just wanted to know what are the dimensions for the sword? Do you make props to sell? I would happily pay for both of kiritos swords. I don’t generally take commissions and I still have use for these specific blades – sorry.